The SDC delivery hub software controls all aspects of software delivery and software pack installation. Don’t have a box available to install your hub? Check our hosting options. Base Infrastructure to begin delivering IDEs within your company, securely and efficiently. Click Next to view the license agreement. Select the I Accept… checkbox, and click Next. Choose server options. 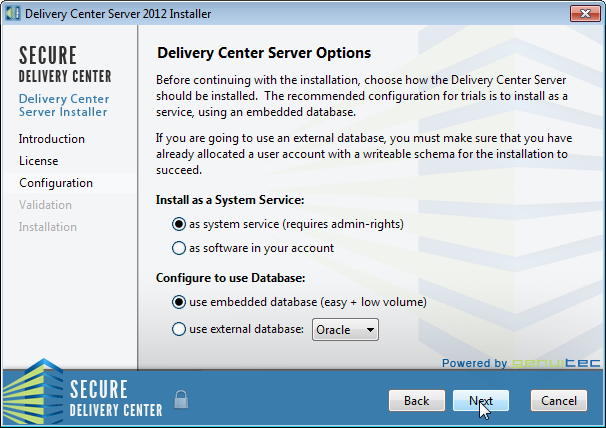 First, you can install SDC as a system service, which requires admin rights, or you can install as software into your user account. Note: When installing on a Mac, the system service option is not supported; therefore, the option is unavailable. 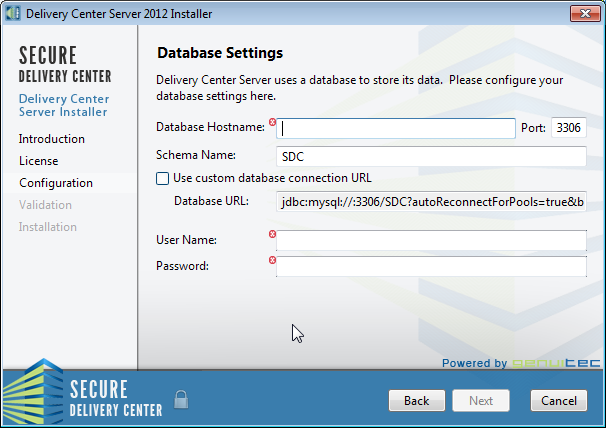 Second, select the database you want to use, either the database embedded within SDC or an existing external database. If you are using an external database, select it from the Use External Database drop-down. You can choose from either Oracle or MySQL. Click Next. If you are using an external database, enter your database information as described below. Otherwise, skip to the following step. Note: In MySQL, the user name and password you enter must have permissions to create tables in the given schema. Specify the installation and data folders. The default paths place the SDC installation folder at the same level as the data files folder. Click Next. Enter the username, name, and password of the initial administrator, and click Next. Enter the hostname or IP address and port at which you want to receive incoming requests. Click Next. Note: If you have a non-static IP address, you should use the computer’s hostname rather than the IP address. This hostname will be part of the SDC web portal URL, so it will be visible to your users. We strongly recommend using a fully qualified domain name so users roaming onto a VPN can still connect to the server. Click Next to install the server. When installation is complete, click Finish. The SDC software starts automatically. 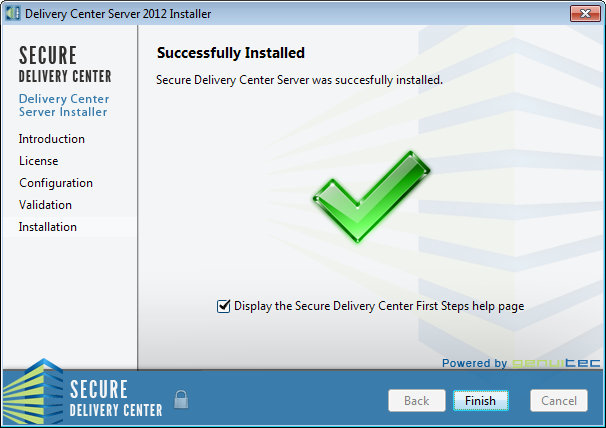 By default, the Display the Secure Delivery Center First Steps Help Page checkbox is selected. This opens the login page to the portal. Log in using the administrator login specified during server installation. Once logged in, a help page opens giving you a list of what to install next, and a link to the Admin Console installer. You should bookmark this help page for future reference. For those installing silently, the link to the help page is in the following format: http://<hostname>:<port>/admin/firststeps/. 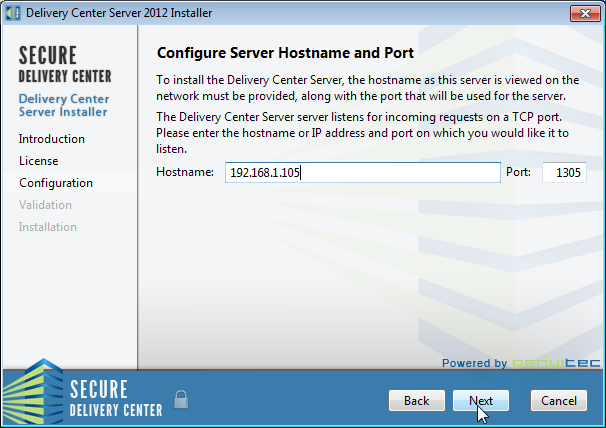 Download the Secure Delivery Center package to your computer. Double click the downloaded file and follow the simple steps. 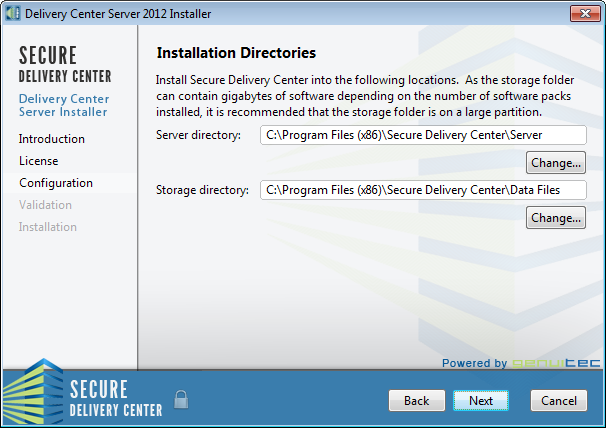 Provide your Email below to stay up to date on the latest changes and new releases of Secure Delivery Center. With the software you’ve just downloaded, you’re now ready to experience the power of SDC’s Delivery Hub in your business. Below please explore our educational links, past webinars, and videos to best understand the full capabilities of this awesome technology.